I saw 3 or 4 Mach RCU's at Pull-a-part just last week when I was down there scavenging. They charge $18 for them. I have a spare one right now that I've been using for testing, but if you're really in need I could part with it and just pick up another next time I'm in the junkyard? Let's do diagnostics on the radio first. Turn the system on, and have it in AM or FM mode. Hold down buttons 3 and 6 simultaneously for a few seconds. The ICP will stop whatever it was doing and show "SP" on the display, and now it's in self-diagnostic mode. Buttons 2 and 3 read off feature or product variant codes, not really relevant here. Button 4 however, is the RCU self-test. Unfortunately it's not exactly all that great a test, it just verifies functionality of some of the ROM and EEPROM chips inside it. It's something though. After hitting button 4, you should get another code on the panel telling you what the RCU found. Code "F" means everything passed. I've attached a chart with the codes. If everything passes, it still sounds like it's the RCU, but I'd get our the multi-meter and test some of the important wires to be sure, as it would be really annoying to drop in a new RCU and still get no sound due to a cut circuit somewhere or something. - lefthand harness ("a") - pin 14 thick gauge yellow wire - should be 12V+ at all times. - middle harness ("b") - pin 17 red w/orange stripe - should be 12V+ in start, park, and neutral. - pins 1 & 15 (blue w/pink & tan) - check that there's about 4v between these two. This is the CAN ACP bus from the ICP. If this bus is disrupted, the RCU would never get the commands from the ICP to change channels, turn vol up, etc. Tan wire is negative. The colors are sometimes slightly different in some years I've found, put the pin locations seem to stay consistent. Last edited by jasen; 03-19-2019 at 02:30 PM. Just found something strange. I ran the self-diags routine on my own car, just on a whim, and my RCU actually came back with a code 7, stereo var. Everything works fine though. 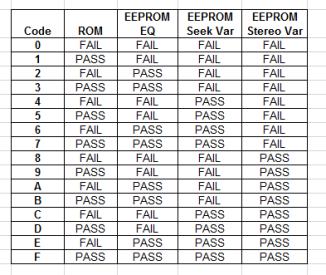 My first thought is that the RCU and ICP are matched at the factory, probably "stereo var" is the static variable in the EEPROM that holds a model identifier for that particular ICP. And since my current RCU came from a car with a tape deck, and I have the CD deck, they are different model codes. I may have to dig into this EEPROM business now, find a reader and see what all is stored on this chip.